Proper cleaning and maintenance of your oven reduces the safety risk of fires, improves the energy efficiency of your oven, and can help extend its useful life. NOTE: The tasks and timings shown here for your Oven (electric) are based on a single-family home (owned), located in Massachusetts, United States, with priority set at ‘1 star' or higher, for all possible goals. If you set your personalization differently in your Home Wizard app, then you may get reminders for different tasks and timings in your recommended home care program for your Oven (electric). 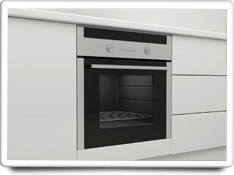 Oven cleaning procedures and maintenance vary significantly by the type of oven (e.g. "self-cleaning, "continuous cleaning", and "conventional") and you should consult your manufacturer's recommendations for the specific procedures for your model. NOTE: For self-cleaning ovens avoid oven cleaners, steel wool, and other abrasive materials that could impair the self-cleaning action. The benefits of this task are moderately high. Doing this task can help prevent kitchen fires, improve the efficiency of your oven, and extend its useful life. The cost of this task is relatively low. It is estimated that this task should only take about 60 minutes to complete, depending on the type of oven you have and your manufacturer's recommended cleaning procedure.